Dr. Santelli was raised in the Oklahoma City area and went to college and pre-medical courses at the University of Central Oklahoma. He is a second generation Chiropractor, Graduating from Cleveland College of Chiropractic Medicine in 1981. He want into practice with his father in Bethany, Oklahoma from 1981 to 1996, when he purchased the Moore Family Clinic in 1997. He was the president of the Oklahoma Chiropractic Association from 1993 to 1994. He received a board certification as a Naturopathic physician in 1996. He received a post-doctoral and Diplomate from the American Board of Chiropractic Internist in 2000 from National College of Health Sciences in Chicago, Illinois. 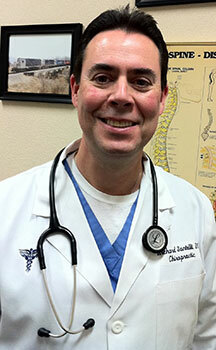 Dr. Santelli is also a board certified chiropractic internist. A chiropractic internist is a graduate of a chiropractic college and holds a healthcare license in his/her resident state. To achieve internist status, Dr. Santelli’s education and training required three additional years of post-doctorate study to be trained in advanced diagnostic techniques such as EKG, vascular testing, lung capacity tests, advanced blood testing, and hormone for male and female disorders. Dr. Santelli is also board certified in oxidative medicine, providing intravenous nutritional health care to his patients. Our clinic provides you with the highest quality natural health care in the friendliest and most caring atmosphere.